The Gentleman Crafter: Stamps and Stencils for cold and rainy days! Gosh, the weather here is totally insanely wet and yucky! Rain and cold...However, it is perfect weather to pull out your art journal and play! Awesome Craft Weather! 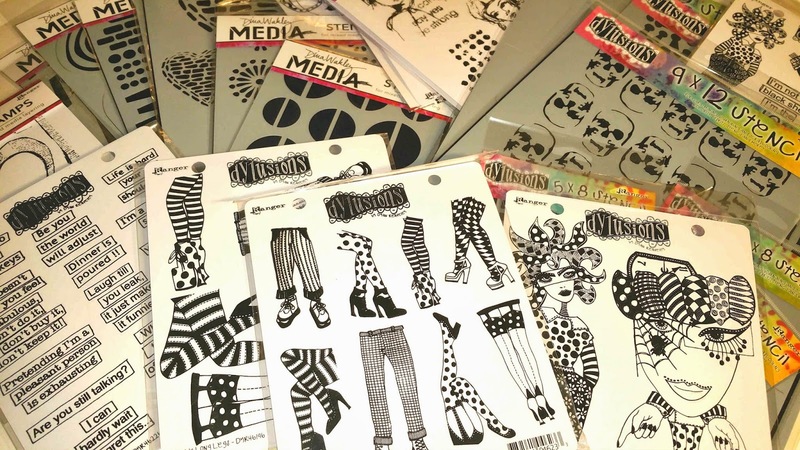 On that note, I have some fabulous stamps and stencils from Dyan Reaveley's, Dylusions Range and Dina Wakley's, Dina Wakley's Media in the shop! They are awesome and so much fun! So... for great NEW stamps and stencils, please click on the shop tab above....Please note the shipping is just a suggestion. I will do my very best to get the best rate to ship to you and refund any overage. Also, just wanted to take a moment and say that I am working madly....well, in-between washing clothes and all kinds of assorted chores...working on the CHA Graphic 45 Lunch Pail....Should be done soon! So, Stay tuned! Can't wait to make the lunchbox!! LOVE it!! !